Integrate data between all partners in a connected supply chain. Warehousing and Distribution. KANE’s tier-1 Warehouse Management System (WMS) optimizes every aspect of our warehousing and distribution operations including inventory management, pick and pack services, receiving, shipping, and tracking. We have established a modern platform for data exchange and collaboration, though we are flexible enough to cater to any customer data exchange preference, from manual to EDI to XML. Transportation. KANE’s transportation management systems support efficient execution of truckload deliveries, cross docking, load consolidation, freight brokerage, and full outsourced transportation management. 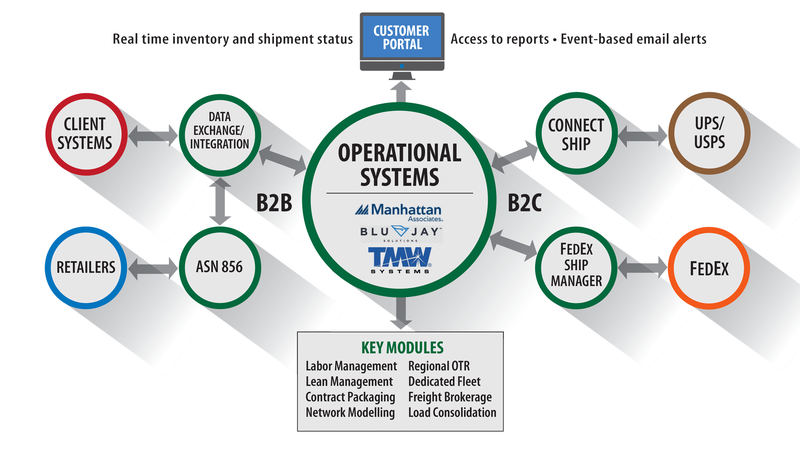 KANE uses Tier-1 systems from TMW (OTR freight optimization) and BluJay Solutions (load consolidation and transportation management) to manage on-time, efficient delivery of freight with complete visibility. Visibility Portal. Customers can monitor inventory and shipments in real-time, via the web, from their desktop or mobile device. KANE’s secure portal supports creation of event-based alerts, as well as standard and custom reports on activity and performance. data between all partners in a connected supply chain.